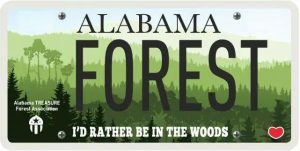 Thank you to all of you across Alabama who support the Alabama TREASURE Forest Association by purchasing our vanity license plate. Proceeds go towards forest education for private landowners and schoolchildren. We do so by hosting regional landowner events, helping counties host Classroom in the Forest for fifth grade students, and having our annual meeting. and find our tag. Or visit your local county tag office and ask for the “I’d Rather Be in the Woods!” plate. © 2017 Alabama TREASURE Forest Association. All Rights Reserved. | Website by PushCrankPress.